Preparing Your House For Winter Starts Now! 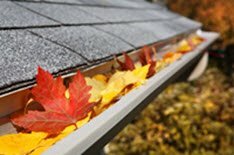 Fall is THE perfect time to prepare your home and property for winter. Whether you like it or not, winter is on its way and it will be here before you know it. To ensure you’re prepared for it, you need to take action now, not once we get our first snow storm. The temperature outside now is just right to get the garden and lawn ready for winter, put away your summer tools and get out your snow shovel and other cold weather tools. Winter in Ontario is a time when many of us hibernate from the cold. We enjoy warm fires, comforters, watch Netflix and generally wait for Spring to arrive. Winter brings with it cold air, snow, and ice – all elements that can damage your house. Do you really want to have to put you Netflix marathon on hold to fix an issue when it’s minus 20 degrees outside? Doubtful! The following guide provides you with some great tips to prepare your home for winter and ensure its safe and free from damage. You’ll learn about essential tasks you need to do so that your home and property can weather (pun intended) the usual Ontario wintry blast. Having your eavestroughs clear of debris is your first line of defense for protecting your roof and your foundation from water and ice damage. Do you remember the ice storm of 1998? It caused over $5 billion in home and property damage. While you can’t eradicate damage from such a vicious storm, you can help to minimize it with some proactive and preventative maintenance. Cracked caulking can cause damage to your windows and sills. They also be a source for water to get into your home. 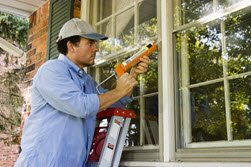 Repairing exterior caulking will make your home less drafty and more comfortable while protecting your windows and helping you save on your energy bills! Cracks from summer sun and aging reduce the effectiveness of weather stripping to keep the cold out. Weather stripping should be replaced every few years. A yearly inspection before winter will help you to keep tabs on how well it’s doing its job. 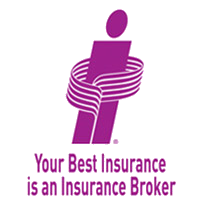 Your roof is critical to the integrity of your home. Damaged shingles can cause water leakage into the attic or the space between the roof and your top floor. The section of the roof that receives the most sun requires your closest attention. These shingles become worn more quickly from heat exposure. Also take notice of missing shingles - an indication you have a potential roof vulnerability. If you notice a roofing issue, have it looked at by a professional. Best way to make sure that you’ll be comfortable this winter is to test your furnace before the really cold winter weather hits. If you’re not sure how well your furnace is working, you’ll have time to have it inspected. Don’t forget to change your air filters too. Winter is the season when we are indoors almost all the time and your furnace – and other heat sources – generate carbon monoxide as they heat your home. A carbon monoxide detector monitors levels in your home and will alert you if levels ever rise. So make sure you test your detector regularly and change the batteries. Most home fires occur during the winter, an important reason to check your smoke alarm. Don’t forget to change your batteries on a regular basis too! 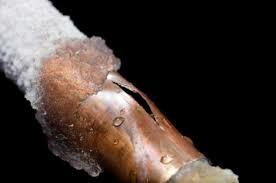 Frozen pipes can cause some serious damage. Look around your home, especially areas where it is not heated and where pipes may run through such as crawlspaces, basements or garages. Wrap the pipes with pre-molded foam rubber sleeves or fiberglass insulation. This will reduce the likelihood of your pipes freezing in the winter and bursting. Getting your entire property, including your garden and lawn also need some TLC before winter. Here are a few tips to prepare your property. 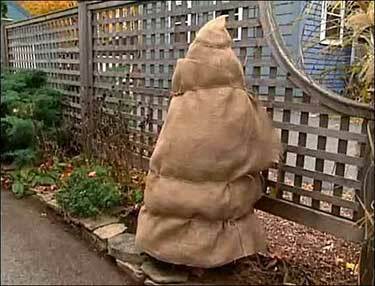 Garden Cleanup : Use leaves from your trees and shrubs for mulch to cover your garden, or bag them and put them curbside. Your municipality may do compost giveaways and your leaves will contribute to the spring mulch! Your gardening friends will thank you. Wrap Your Shrubs : Some shrubs can’t survive our cold climate without getting damaged. Wrap those shrubs to prevent tips and branches from being frost-bitten. The benefit - you’ll have a beautiful garden come spring. Store Your Patio Furniture : Protect that outdoor living furniture by storing in a shed or wrapping securely. Seal Your Driveway : You’ll protect your driveway and add years to its life by sealing it from cold winter damage. Turn Off Your Exterior Water & Drain Hoses : This is a must do! If you have water in your lines, hoses or pipes and they freeze, you can have an expensive problem indoors. Burst pipes can mean flooded basements and ruined flooring and furniture. Clear Out Your Garage : Clearing out your garage will make space for your car and help protect it from winter weather. Tune-Up Your Snow Blower : There’s nothing worse than getting hit with a snowstorm only to find that you snow blower isn’t working. Take it for a tune up (or do it yourself) before that first storm. Don’t forget to check you’ve got fuel for it too! Store Your Summer Yard Equipment : Store your leaf blower and your lawn mower in a shed or garage away from the elements. Giving your machinery a good clean before you store it away means that you’ll be ready for Spring. Bring Out Salt and Sand For Your Driveway : Check your supply and stock up before the first snow. Think about using some green alternatives to protect your garden, grass, driveway and the environment. Home Maintenance is time consuming and sometimes uncomfortable. But the time investment is worth it. You’ll protect your home and get more out of what you’ve invested in it. More importantly, you’ll avoid potential problems that winter weather can create – freeing up more time for you to do the things you enjoy – like spend time with your family, or binge watch the latest series on Netflix. While you’re in maintenance mode, why not go a little further? Get your car ready for winter too.